Bun Pi Mai, the start of the New Year in Laos, is a splashy good time for visitors, although a decidedly more gentle ordeal than its same-day counterpart in Thailand (Songkran). The Lao New Year takes place in the middle of the hot summer season, in April. The new year celebrations usually last three days – 13-15 or 14-16 – though festivities in major locales can last longer than that (Luang Prabang’s Bun Pi Mai lasts for about 10 days). During the New Year, the Lao believe that the old spirit of Sangkhan leaves this plane, making way for a new one. This belief – like the rest of Bun Pi Mai – is grounded in the Brahmanic and animistic religions that long preceded Theravada Buddhism, says former Culture Research Institute head Houmphanh Rattanavong. The first day of Bun Pi Mai, known as Sangkhan Luang, is considered the last day of the old year. Lao will clean their houses and villages on this day, and prepare water, perfume, and flowers for the days ahead. The second day, the Sangkhan Nao or "day of no day", is neither part of the old year nor of the new year. The third day, known as Sangkhan Kheun Pi Mai is the official start of the Lao New Year. Locals dress in their finest silk clothes and perform Tak Bat, the traditional offering of alms to Buddhist monks; then climb Mount Phousi to pray at the stupa at its summit. At family gatherings later in the day, locals hold baci ceremonies for good health, and beg senior family members for forgiveness. Read more about Laos' lively festivals. You can also find out more about how the Buddhist New Year is celebrated throughout Southeast Asia. During the New Year, water plays a big part in the festivities – Lao bathe Buddha images in their local temples, pouring jasmine-scented water and flower petals on the sculptures. The faithful will also build sand stupas and decorate these with flowers and string. At each temple, monks will provide the water, as well as blessings for the devotees flocking to the temples and the white bai sri strings, which they will tie around devotees' wrists. People also get soaked during Bun Pi Mai – people respectfully pour water on monks and elders, and less reverently on each other! 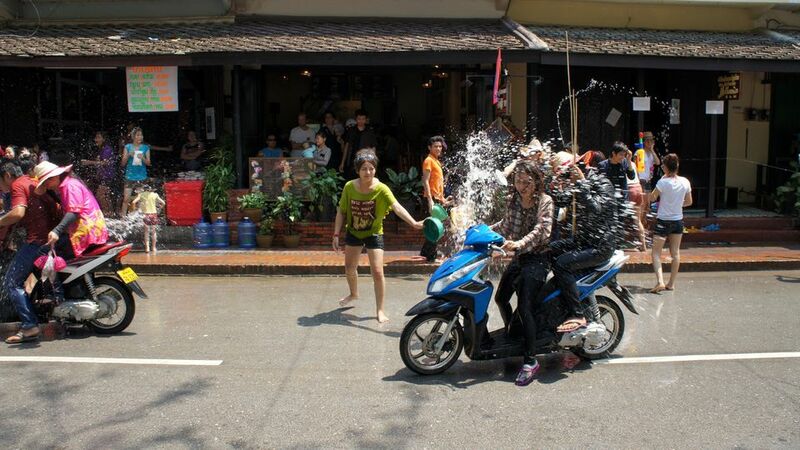 Foreigners are not exempt from this treatment – if you're in Laos during Bun Pi Mai, do expect to be soaked by passing teenagers, who'll give you the wet treatment from buckets of water, hoses, or high-pressure water guns. Locals sometimes throw flour as well as water, so you’ll feel both wet and doughy at the end of the holiday. Read more about etiquette for visiting Buddhist temples, and on a related note, check out the Tak Bat almsgiving ceremony in Luang Prabang, Laos. While Bun Pi Mai is celebrated throughout Laos, tourists should be at Vientiane or Luang Prabang to see the holiday at its most intense. In Vientiane, families make the rounds of the different temples to bathe the Buddha statues, especially the ones at Wat Phra Kaew, the city's oldest temple. Luang Prabang is probably the best place to celebrate Bun Pi Mai in Laos, as it is the former royal capital and a present-day UNESCO World Heritage site. In Luang Prabang, the celebrations can stretch out to a full seven days, celebrated in different places around the city. Hae Vor. Named after the vor palanquins carrying temple abbots, this elaborate procession kicks off Sangkhan Luang: leaders of the town’s most notable Buddhist temples ride in gilded, pagoda-shaped palanquins, flanked by monks and other devotees, as watchers sprinkle water on the procession passing by. The winner of that year’s Nang Sangkhan (Miss New Year) beauty pageant also takes pride of place in the procession, borne aloft an animal-shaped float, bearing a four-faced effigy head in turn. The Nang Sangkhan tradition derives from the myth of Phaya Kabinlaphom and his seven daughters. Kabinlaphom was a four-faced demigod who foresaw his demise by decapitation – he decreed that his daughters would take turns riding an animal to the cave where his head would be kept and sprinkle it with fragrant water. Elephant procession. Colorfully-garbed pachyderms guided by mahouts in full costume kick off the first day of the New Year festivities: an Elephant procession (Chang hieng koei) will wind its way from Wat Mai to Wat Xiengthong. Market fairs. Beyond the usual Luang Prabang Night Market, the town hosts several fairs throughout the Bun Pi Mai holiday: a textile fair at Phanom craft village, a Lolat Market Fair on the streets of the UNESCO World Heritage town, and a temple fair on the grounds of That Luang that also include traditional performances. Sand stupa making. At the Hat Muang Khoun sandbar located in Chomphet District across the river from Luang Prabang, locals build sand stupas called toppathatsay to make merit, decorate them with flowers and hand-painted flags, and sprinkle river water on each other. The locals believe that these sand stupas prevent evil spirits from passing over from the previous year into the new one. Pha Bang procession. At Wat Mai, a gilded statue of the Buddha known as the Pha Bang (also spelled Prabang – it's the actual namesake of the city) is installed after a procession from the Royal Palace Museum, and bathed under a temporary pavilion through sluice pipes carved into the shape of legendary water serpents. The first ceremonial waters will be poured by personifications of the Lao ancestors, two red-faced toothy heads called Grandfather and Grandmother Nyeu and a lion-faced mascot named Sing Kaew Sing Kham. During its stay at Wat Mai, locals will also have the chance to pour water on the Pha Bang, as a way of making merit for the coming year. The New Year comes to its official end when the Pha Bang is brought back to the Museum three days later. Bun Pi Mai is considered part of peak tourist season in Laos, so don't expect to make any bookings on the spur of the moment. If you want to be in Luang Prabang or Vang Vieng during the Lao New Year, book at least two months in advance to get the dates you want. Consider it unavoidable: you will get wet during Bun Pi Mai. (So will everybody else.) At the same time, there are certain locals you shouldn't throw water at – monks, elders, and maybe the occasional well-dressed woman on her way to an important New Year event! Choose your targets judiciously, but expect to be liberally soaked. Stay merry, and use the traditional New Year greetings liberally – either sok di pi mai or sabaidi pi mai, both of which approximate “Happy New Year”!